Gone but never forgotten! Below we've archived our previous Beer. Rich Stout brewed with Oatmeal, Lactose, and Rostov’s Komodo Dragon and Sumatra Mandehling coffee’s. Made in Collaboration with Endeavor Art Studio. Slightly different than a traditional Oktoberfest because of the English ale yeast and slight increase in Hop Character. Fermented cooler than normal ale temperatures and lagered prior to release. A deliciously dry Saison crafted with Sassafras Root and Stem foraged by our brewer. 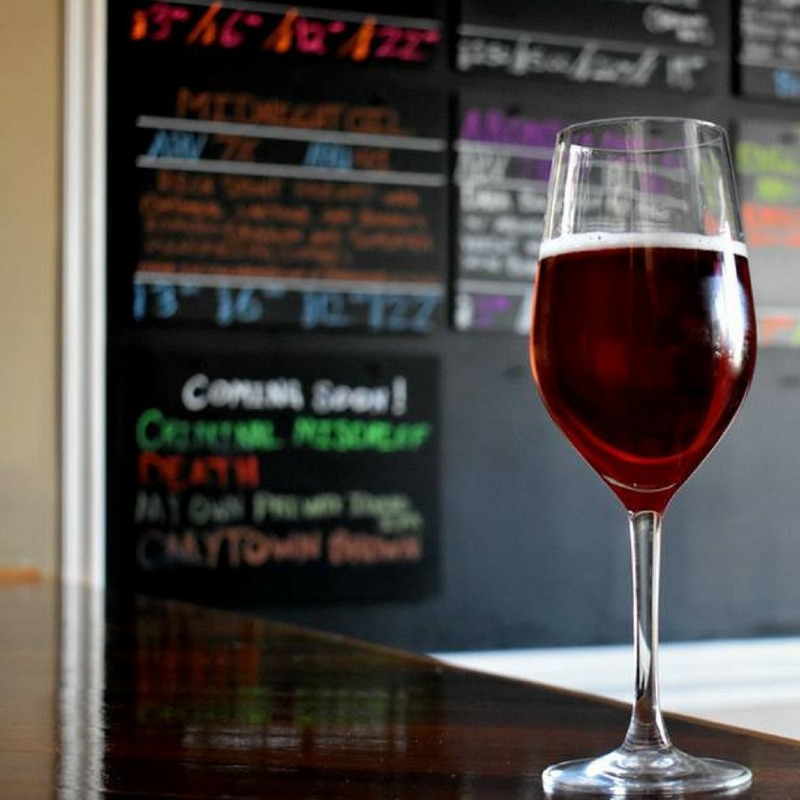 In Collaboration with Take The Fight, a non profit helping improve health care for cancer patients, we brewed a Dark Belgian Ale made with Aronia Berries and Petit Verdot wine Grapes, both reported to have anti cancer properties. Both Petit Verdot and Aronia berries are high in polyphenoles, such as anthocyanins. Aronia have the highest measured anthocyanin content of any plant species (1480 mg per 100g). Anthocyanins are powerful antioxidants that are known to slow the growth of certain tumors. Fermented in Red Wine Barrels. Strong Belgian Gold brewed with spices including foraged Spice Bush Leaves. Brewed in collaboration with VCU’s Rice River Center. Sessionable IPA made with Pellet, Whole Flower, and Cryo Hops. Our take on a traditional Oktoberfest with slightly elevated hop and malt characters. Complex DIPA crafted with Cryo Hops Lupulin Powder. We crafted this very tart and dry Saison with the invasive species Autumn Olive’s berries for our Charity beer and wine dinner supporting the vital work being done by VCU’s River Rice Center, August 28th, 2017. We allowed the wild yeast and bacteria present in the Autumn Olive berry puree to lend acidity and complex flavors to this brew. Crafted with a high proportion of Wheat & Virginia malts & balanced with a firm bitterness from Meridian, Sorachi Ace, Calypso, & Centennial Hops. A wonderful amber Saison, fermented with sweet orange peel and hibiscus flowers. This ale is usually fermented in wine barrels. Pleasantly fruity and quite drinkable. American IPA crafted with Virginia Barley & Belma Hops. Made for The Street Fighter II Turbo SNES Tournament, Soundtrack Release, & Beer Release Party Fundraiser to benefit Building a Better RPS. German Wheat Ale accentuated with a big hit of Rye Malt, Lemongrass, Grains of Paradise, Peppercorns, Sweet Orange Peels, Mediterranean Sea Salt and Coriander. Classic west coast Red IPA. Malty sweetness balanced by a clean lingering bitterness. IPA crafted with El Dorado Hop Hash and El Dorado hops. Dank Double IPA brewed with Hop Hash from the new hop variety Idaho 7. Hop hash is the resinous, sticky, and gooey hop oils that are collected when processing fresh hop flowers. It is intense, tropical, and bursting with hop goodness. Triple Dry Hopping with Citra, Azacca, and Palisade Hops. Crafted with Cherry Wood Smoked Malt and Virginia grown barley malt. Fermented in red wine barrels. Belgian Wit that strays from the style guidelines from the jump. Bursting with citrus character, refreshing and crushable. Fermented in Syrah Barrels. Smoked ale that pulls inspiration from Scottish Ales and German Rauch Beers. This ale is brewed with judicious amounts of Cherry Wood Smoked Malts and plenty of caramel malts for balance. Classic English Mild with notes of caramel and chocolate. A refreshing ale brewed with a botanical bounty of fresh fruits, herbs, and flowers. Made with Virginia grown malt and fermented in wine barrels. Belgian Wit crafted with Kumquats to help accent the citrus character of the Bitter & Sweet orange peels as well as the coriander and the grains of paradise. Fermented in Red Wine Barrels. A Belgian Dubbel crafted with Trappist Yeast and Four Fruits (Blueberries, Aronia Berries, Currants, and Raisins). Fermented in Napa Valley Cabernet Sauvignon & Cabernet Franc wine barrels. To celebrate our 2 year anniversary we crafted an ale that is a blend of beer and wine styles. It is nicely balanced between tart wheat characteristics and fruit forward wine flavors. Crafted with the juice and wine of the famous French grape variety Petit Verdot from Garden Grove’s own Vineyard in Delaplane, VA. Fermented and aged in Red Wine Barrels. A Saison crafted to follow in the tradition of classics like Saison Dupont. Classic English Pale Ale crafted with a variety of UK hops and Fermented in red wine barrels. Belgian Gold brewed to be crisp, quaff-able and to highlight the noble hop character of French Strisselspalt hops. Fruit forward and malty Belgian Golden Ale. Aged for 3 months. Accented with Tangerine and Rose Petals and Lemony Sorachi Ace Hops. A unique Belgian Dubbel crafted with 3 distinct yeast strains and 5 perfectly suited fruits. Fermented in Red Wine Barrels. The Aronia berries, Blueberries, Figs, Raisins, & Currants heighten the dark fruit character of our Belgian Dubbel. Our 100th unique brew is a English Old Ale made in collaboration with RVA Magazine. It was fermented in French Oak red wine barrels and aged for 6 months in American Oak Chardonnay Barrels. It shows a rich malt character accented with molasses; along with fruity esters accented with raisins, aronia berries, and pomegranate molasses. European Golden Ale with the bitterness of a great Bohemian Pilsner. Brewed with French and New Zealand Hops and lagered at 32 degrees Fahrenheit for 45 days. Belgian Pale Ale fermented with Duvel’s Classic Yeast. Crafted with a blend of New World and Old World hops. This wheat ale is a twist on a Belgian Wit beer. Instead of the traditional Belgian Wit yeast we used a French yeast and added a generous amount of citrus and spices. The addition of copious amounts of rye malt add a spicy dimension to this malty red ale. A selection of intensely fruity, herbal, and spicy hops round out the complex flavor profile. In collaboration with Elwood Thompson’s and Tricycle Gardens we created a fruit forward Saison crafted with organic ingredients. Elwood Thompsom’s provided organic Papaya, Apricot, Peach, & Apple Juices. We used organically grown hops provided by Tricycle Gardens (Cascade) and Garden Grove (Columbus). We used Organic Barley & Wheat as the base. We crafted this porter based on two historic recipes. The first is a Spruce Beer recipe we found in “The Virginia House Wife” Circa 1831 by Mary Randolph. This recipe includes young Spruce Tips (harvested from my yard this spring) Molasses, All Spice, and Ginger. The second, pulled from the Smithsonian archives, is George Washington’s recipe for a Molasses, Grain, and Hops based porter. We followed these recipes as close as possible including fermenting the beer in oak casks. Juliette is not a traditional woman. She was fermented in red wine barrels and crafted with apricot, sweet orange peel, and fruit forward American Hops. Expressive and bursting with fruit. Foreign Export Stout that is rich, silky, & heady crafted with massive amounts of chocolate and vanilla bean. Fermented in oak barrels and aged on Madagascar Vanilla Bean. The Lonely Monk is an intense version of the Trappist Single. A substantial malt bill translated to big flavors and a higher than typical alcohol content for the style. It is still sessionable for a Belgian Abbey and it is loaded with Fruity, Spicy, and Malty flavors. Fermented in Wine Barrels. Our take on a Belgian Wit fermented in wine barrels. Highly quaffable. Belgian Abbey Ale made with Kenyan Lion’s Mane Tea, fermented in red wine barrels. Garden Grove Stout is dry, crisp, has a pronounced roasted character and plenty of chocolate. It was fermented in wine barrels which lend mild vanilla notes. The evil little brother our Belgian Dubbel, The Devil. Little Devil has a similar malt richness and dark fruit character as his big brother but is slightly more sessionable and fermented in Red Wine barrels. This is a nontraditional Belgian red ale fermented in red wine barrels and brewed with Pomegranate juice and Pomegranate seeds. Like a good red wine it is bursting with fruit but balanced with bitterness from the pomegranate seeds, wine barrels, and Mosaic hops. The Cellar Saison is a counterpoint to our fruity Farmhouse Saison. It is made in the style of Saisons that is currently more fashionable, dry, light color, restrained malt character and has a more spicy than fruity yeast character. It was fermented in 2013 French oak Russian River Valley Pinot Noir barrels. The barrels enhanced the saison with a subtle dark fruit flavor and pronounced oak tannins and character. An RVA take on a Belgian Single. In the great tradition, this one’s designed to be your daily ration. Light roasted flavors in this delicious and sessionable English Mild Ale… straight outta Richmond! Our Belgian IPA was created in collaboration with Southbound Chef Craig Perkinson. It was crafted with Kumquats to elevate the fruity Belgian Yeast and the lemon character of the Sorachi Ace hops. A BENEFIT BREW IN COLLABORATION WITH TRICYCLE GARDENS! Chocolate Chili-Pepper Porter with a mild, pleasing heat that builds over time. Featuring Ancho, Pasilla, and fresh Anaheim Peppers grown at Tricycle Gardens Urban Farm in Manchester. A new breed of Belgian ale we created blurring the boundaries of the Quadruple style and White Wine, we call it a “White Quadruple”. Life is formulated with the New York grown white wine grape Gewürztraminer. Life was fermented in stainless steel and aged in California Chardonnay barrels. It shares many of the attributes of a classic Belgian Quadruple but with a malt profile designed to create a balance with the Gewürztraminer grapes. A Black Ale made with British Malts & Yeast, and Hops from Germany & the UK. Our Black ale was fermented in red wine barrels and showcases a hop character that is Herbal, earthy, and spicy. While this one doesn’t fit neatly into style categories, we’d call it halfway between a Kölsch and Märzen. Fermented with English ale yeast at cooler temperatures and finished with a lightly elevated hop character. Brewed with 100% Virginia Grown whole cone hops from Rocky Knoll Hop Farms. Boasting the balance of a classic British Pale Ale with wonderfully expressive aromatics and roundness on the palate. A dark amber ale. Barrel-fermented. German Magnum hops provide a clean, lingering bitterness and fresh character. Cask-fermented Oatmeal Stout featuring roasty malt flavors and a silky smooth texture. Classic British malts lend a malty & toasty backbone, a wonderful springboard for the American IPA hops that are in style today. This IPA is a little bitter but with a sweet maltiness that supports the intense citrus, tropical, pine, and fruit character of the American hops. A Drinkable, light bodied Belgian Wit. Wonderful summer beer. Tart Character from the yeast and Wheat malt. Not a traditional Wit that is made with orange peel and coriander. Ours is made with Lemongrass and Grains of paradise. A classic oyster stout where whole oysters are added directly to the kettle. Smoked, rye, toasted, and roasted malt create the perfect structure to support the intense flavor of the oysters. Hops with earthy and citrus fruit character create a nice bright balance to the briny and meaty flavors. Aroma: Briny Minerality, Smoke, Umami, Mocha, Chocolate Covered Orange. Flavor: Sea Salt, Minerality, Umami, Coffee, Mocha, Caramelized Sugar, Brine, Meaty, Smoked Oysters. Loads of rich fruit you expect from a darker Belgian ale. Brewed with raisins as well as figs & hops grown in Richmond! Don’t expect the typical heavy and sweet dark Abbey. This ale is crafted to be dry making it reminiscent of a dry red wine. From our wine-like sparkler series, this fresh & floral Beer/Mead hybrid is made with dried peach, hibiscus, and rose petals. Aged in Cabernet Sauvignon barrels, fermented dry. A compelling Belgian Blonde fermented with a trifecta of yeasts (Pinot Noir, Duvel, and Saison Dupont). Brewed with Sumac Berries and Sorachi Ace hops. Sometimes brewed in wine barrels and sometimes brewed in stainless steel. A sessionable India Amber Ale that is a blend of UK, Australian, West Coast, and Virginia Grown Hops. The malt character is richer than a typically IPA helping to create a balanced brew. Aroma: Strawberry, Watermelon, Mango, Pineapple, Bready, Caramel. Flavor: Orange Marmalade, Honeysuckle, Toast, Orange Zest, Berries, Orange Pound Cake. A rich coffee stout bursting with cold pressed coffee flavors and aroma thanks to Rostov’s coffee (Organic Peru, Bourbon Santos, Jeremy’s Blend). A sessionable Belgian Abbey made with Ancho and Passilla Chilis and Black Cherries aged in Cabernet Sauvignon red wine barrels from the Napa Valley. This beer is not designed to have spice character but showcase the dark fruit and tobacco flavors of the chilis. A uniquely made Belgian Abbey. Fermented with Saison yeast but rich dark malts and a blend of Yirgacheffe and Rugeju coffee from Rostov’s Coffee & Tea. Yiracheffe is an Ethiopian grown bean that has surprising aromas of citrus fruit, brambles, and wine. The Rugeju beans used are aged in wine barrels and provide wonderful fruit foward coffee flavors. Fermentation in Russian River Pinot Noir barrels lend a complex dark fruit and subtle wine flavor. Aroma: Fig, Prune, Vanilla, Red Wine, Raisin, Burnt Caramel, Toffee. A uniquely made Belgian Saison. Fermented with Saison yeast but rich dark malts make this Saison a beautiful red color. A healthy dose of Thompson raisins and fermented and aged in Napa Valley Cabernet Sauvignon barrels for one month lend a complex dark fruit and rich wine flavor. The mouthfeel and after taste are wonderfully enhanced by barrel, raisin, and wine based tannins. There is still some bright fruit and pleasant acidity that comes through because of the Saison yeast. A sessionable IPA made entirely from New Zealand And Australian Hops. Uniquely Fruity and Intensely Bitter. Incredible Hop Aroma and Flavor with a touch of British toasty malts to back it up. Elegant expression of a classic Belgian Tripel, brewed with whole-cone Kashmir hops grown on Pharsalia Hop Farm in North Carolina. A fruit forward and malty Belgian Pale. The Belgian yeast is the star highlighting classic Belgian characteristics. 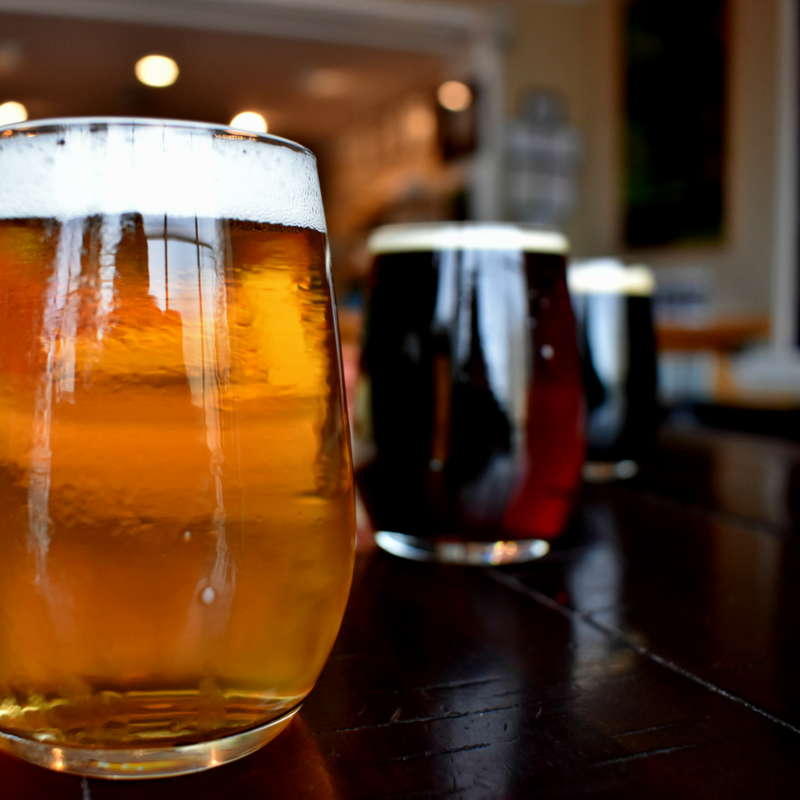 Lucent’s Fare features hops grown in Richmond, VA & Petersburg, VA. The malts add a delicious toasty and slightly sweet background. Beautiful orange hue. Aroma: Exotic Yeast, Tropical, Pepper, Biscuit, Banana, Pumpernickel, Lemon, Asian Pear. Flavor: Pear, Asian Five Spice, Citrus, Ginger, Peppercorn, Bready Malt. A Belgian Cherry Wheat Ale that showcases approachable tart cherry flavors. Very pleasant and light. A solid wheat and pilsner malt backbone with structure added by fermenting in Cabernet Sauvignon barrels. Peat and oak smoked malts coupled with an extended boil time create a malt forward mildly smoky beer. Aroma: Peat, Oak Smoke, Toffee, Earthy, and Charcoal notes. Flavor: Peat, smoke, Toffee, Caramel, Bread, and Toast. This IPA featuring hops entirely from New Zealand and Australia introduces a unique hop character. The malt character is rich yet the beer is still dry and crisp ensuring that the hops are the star attraction. Aroma: Mango, Pineapple, White Grapefruit, Boxwood, Honeydew, Lime, Lemon Thyme. Flavor: Mango, Lime, Passion Fruit, Cointreau, White Peach, Limestone, Citrus Zest, Pineapple, Candied Papaya. In collaboration with Shyndigz Dessert Restaurant we crafted a porter designed to replicate their Salted Caramel Chocolate Cake. We followed their recipe and ingredient list as closely as possible and have created a deliciously decadent dessert beer. Dessert in a glass. A chocolate lovers dream beer. Intentionally sweet and oozing with creamy caramel. Just enough salt to balance the sweetness. Aroma: Dark Chocolate, Caramel, Candy Bar. Flavor: Layers of Chocolate, Sweet Caramel, Brown Sugar, Almond, Salt. A new take on the classic English Pale Ale brewed exclusively with the Australian hops Galaxy and Summer. Aroma: Stonefruit, tropical, peach, pear, fresh bread, honeydew melon. Flavor: Bready, Toast, Candied pear, floral, peach, melon. Partisan Pilsner is made in a richer fuller style reminiscent of beers made before prohibition reduced beers to the weak adjunct produced American lagers unfortunately still popular around the world today. It is malty and balanced with a fine European hop bitterness. Smooth Porter crafted with milk sugar and cold brewed Rostov’s Bali Blue Moon Coffee. Fermented in Wine Barrels. Hybrid between an English & Belgian Brown fermented with Red Sour Cherries in Red Wine Barrels. Our British red ale is an exercise in malt and hop excess. The malt and hop characters are in a battle to be the stars. Aroma: Caramel, Plums, Toast, Earth, Floral, Spice, Herbal, Currant, Bramble, Thyme. Flavor: Malty, Caramel, Biscuit, Floral, Earthy, Herbal. Single Hop IPA crafted with Idaho 7 Hops and Idaho 7 Hop Hash. Real fruity IPA. A pale ale highlighting Meridian and Calypso Hops and made entirely with Virginia Grown barley from Riverbend Malt House in North Carolina. Support Local! In collaboration with the epic rock band Big Mama Shakes we present Big Mama Brown. BMB is an imperial brown ale crafted with loads of brown sugar & UK East Kent Golding Hops. We proudly partnered with TEDxRVAWomenand their big “It’s About Time” event at the Byrd Theatre, crafting a Belgian ale accented with Elderflowers and Lemon Thyme harvested from Tricycle Gardens Urban Farm in Manchester. It has pronounced floral notes and delicious floral and thyme flavors. It was fermented in wine barrels with Belgian Wit yeast. This IPA featuring hops entirely from New Zealand and Australia introduces a fruit forward hop character complemented by Tangerine peels. The malt character is rich yet the beer is still dry and crisp ensuring that the hops are the star attraction. A non-traditional Belgian Red accented with Elderberries and Black Cherries. The dark malts and fruits intertwine to make for a balanced dark Belgian ale. Fermented in Russian Rive Pinot Noir Barrels. A rich and earthy dark amber French Bière de Garde bursting with dark dried fruits character. In collaboration with Capital Ale House Midlothian we crafted a rich stout reminiscent of a dark chocolate bar naturally flavored with orange peel. The intense roast character is balanced by the sweet orange peel and citrusy centennial hops grown & harvested onsite at Capital Ale Midlo. Our Chocolate porter was brewed with a healthy dose of chocolate malts and we ensured that the fermentation created a very dry beer with flavors reminiscent of a bitter dark chocolate bar. We then added another delicious layer of chocolate flavor by conducting a three day cold soak with Upchurch Chocolate Company’s house roasted, fair trade, Madagascar chocolate beans. A slightly tart, lightly salted wheat ale brewed with locally grown Damson Plums. A special brew to benefit Children’s Hospital Foundation. Lemon Grove is crisp, dry and refreshing, crafted with lemon zest, Sorachi Ace hops and locally grown lemongrass. $1 for every glass sold will be donated to CHF! An English Mild made with Virginia grown African Finger Millet that was house toasted. An English mild (British beer), that was inspired by a Munich Dunkel (German beer), made with African Finger Millet, that was grown and toasted in Virginia. An English Barley Wine Fermented with English Ale yeast and finished with three additional yeasts (Saison and two different wine yeasts). This deep, complex brew was crafted with a large proportion of Indian Palm Sugar known as Jaggery and a small amount of molasses. Aged 6 months in red wine barrels. An Imperial Coffee Milk Stout crafted with six dozen Sugar Shack chocolate glazed donuts and cold extracted Rostov’s Coffee. Perfect for weekend mornings. It is creamy, doughy, chocolaty and packs a smooth coffee punch. St. TAMO is a dark Belgian abbey named after our friend and awesome radio personality TAMO. It is made with rich amber to dark burgundy colored malts and has a wonderful dark fruit character enhanced by the addition of Tamarind. This is a Belgian Dubbel that leans into a Quad. St. Rufus is named after the Brewer’s Bernese Mountain Dog “Rufus”. When Rufus was four months old he had surgery for a broken leg and hip dysplasia. When he was two he had a skin condition that was so agonizing he had to be restrained to prevent him from scratching off his own skin. In the last six months he has had four surgeries all related to a blocked intestinal track. With all the medical issues Rufus has overcome this dog is at least a warrior but to us he has achieved a saintly status. The Phoenix is based on a traditional Red Ale recipe but we decided to balance the bright hoppy flavors with roasted, dark, and umami flavors. This was done by including in the malt recipe non traditionally used roasted grains and by aging the ale for a longer than typical time frame. 16 unique grains including rice varieties such as Wild, Red, & Black were used in this brew. The rich multi-grain flavor is accented with the addition of a rich & smokey 35 year old Sorghum Molasses. This ale is from an long gone era. It was even fermented in red wine barrels. We were not concerned with modern ingredients or techniques here. Pushing the boundaries of Belgian beer into the realm of wine. We strive to bring out as much ripe and dark fruit flavors reminiscent of rich red wines as possible by fermenting with red wine grapes from each year’s harvest. Death is made once a year in tandem with the Virginia wine grape harvest schedule. We age our Belgian Abbey in fairly new red wine barrels for over 1 year. The wine grapes add intriguing fruit and tannin flavors as well as a wonderful bright acidity. Flavor: Warm Alcohol, Bright Fruit, Sweetness, Red Wine, Oak, Caramel, Toasty Malt, Spice. Pushing the boundaries of Belgian beer into the realm of wine. We strive to bring out as much ripe and dark fruit flavors reminiscent of rich red wines as possible by fermenting with 2015 Virginia Cabernet Franc grapes grown by Naked Mountain Vineyard. We then transferred our Quadruple into Cabernet Sauvignon wine barrels just as primary fermentation slows and conducted an extended aging for 12 months. Aroma: Fig, Raisin, Prune, Dark Fruit, Port, Hazelnut, Red Wine, Oak, Vanilla, Coconut. Flavor: Bright Fruit, Fig, Sweetness, Red Wine, Oak, Caramel, Toasty Malt, Spice, Ripe Tannins. A wonderful mashup of two of our favorite styles of beer, Saison & IPA. In this ale both styles showcase their individuality while complementing the other. Dry crisp malt character, Spicy, Peppery, Fruit Esters, and Fruit and Tropical hop notes. Our attempt to make a dry Rosé. A very simple malt base fermented with wine and Belgian yeast. This ensures the beer is fruity, dry and well suited to highlight the flavors extracted from the wine barrels. Our Rosé was fermented in Russian River Pinot Noir Barrels and aged in Chardonnay barrels for six months and gains color and acidity from hibiscus flowers. Dry, Austere, and great acidity. A Belgian Blonde brewed with Black, Pink, Green, & White peppercorns to help accent the spicy Belgian yeast character. Garden Grove Pale Ale is crafted with a blend of intense and fruit forward west coast hops atop a clean malt base. Barrel aged Biere de Miel edition of our beloved Farmhouse Saison. Brewed with additions of orange peel, hibiscus, chamomile & orange blossom honey. Only one barrel made! A very classic Irish Stout. Our Strong Scotch is a unique brew crafted in collaboration with executive chef Will Longoria from The Rouge Gentleman. We took the rich smoky flavors of a traditional Scotch Ale to new heights with the addition of a special ingredient formulated just for us by Chef Longoria, Laphroaig Scotch Infused Duck Bacon. This is a true original. This may be the only beer on the planet ever crafted with Duck Bacon. Fermented in Wine Barrels. A Radler built on a light Belgian Ale base. Complemented with Honey, Fresh Lemons, and our house made Ginger Ale.